Give your passenger added enjoyment on rides together! Fits: '98-'13 Touring w/rigid mounted or detachable King or Chopped Tour-Paks. Will not fit Trikes. GR-09: Part of the thrill of riding a motorcycle is the control & connection to the machine during cornering, acceleration, & braking. But for the passenger the same maneuvers can be a little more spine-chilling than enjoyable. 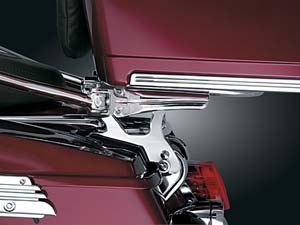 These beautifully chromed and padded Passenger Grab Rails are designed to provide a similar feeling of control security. You'll have happier passengers as well as a great additional place to secure small packages, jackets, etc. 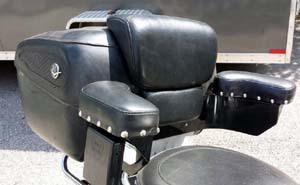 Fits: ‘99 - ’13 Electra Glides, Street Glides, Road Kings, Road Glides & '99 to current Trikes. AR-53: Keep the passenger comfortable with this versatile armrest kit! 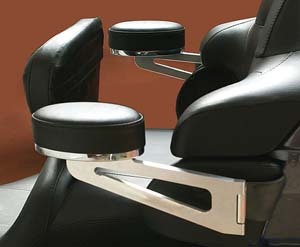 Armrests can be adjusted vertically and rotated out of the way when mounting and dismounting. Remove the armrests with a simple push of a button when not needed. Mounting bracket conveniently mounts between the Tour-Pak and speaker housing. Includes one cup holder installed on the right side - supplied cup holder can be moved to left side or a second cup holder can be added, (P/N 8954), sold separately. Fits 2014 to current Touring and Tri-Glides. 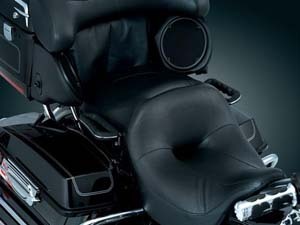 AR-313: Deluxe Armrst system, Black, for Harley FLH Passenger, Tour Pak 2014 to current. AR-58: Ultimate comfort & convenience in a compact, sturdy package! Support brackets are nearly invisible & fastened between Tour-Pak lid & pad. 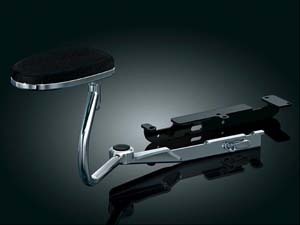 Each arm has two mounting locations & pivot has an adjustable stop for fine tuning pad position. Padded over-molded arm folds back out of the way. Fits: '97-'13 Electra Glides (except '10-'13 FLHTCUSE), Road Glides (except '11 FLTRUSE), Road Kings, Street Glides, Tour Glides & Trikes Equipped with King or Ultra Tour Pak. AM-94-14: These fully adjustable armrests are CNC machined from solid billet aluminum, hand-polished to a flawless finish and triple chrome-plated with extremely comfortable padded and water-resistant upholstered cushions. The set features a pivoting design that allows an easy passenger access. The arms have adjustments for width to provide maximum passenger comfort. 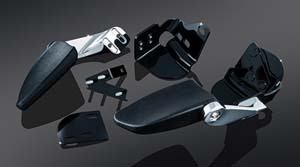 Sturdy black powder coated steel backing plates offer a secure and rigid mounting, and the armrests are rated at a 30lb. working load and have been tested to 60lb. static load. Fits King Tour-Paks®, 2014 & newer models, including the Tri-Glide Trike. 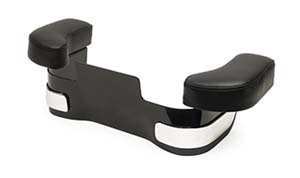 Includes mounting bracket for CH style cupholders, either Switch Mount or Handlebar Mount, sold separately on our Cup Holder page. 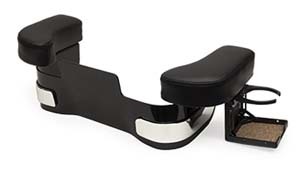 AM-94: This fully adjustable set of armrests is the finest available. CNC machined from solid billet aluminum, hand-polished to a flawless finish and triple chrome-plated with luxuriously padded and upholstered cushions, they feature a new and innovative horizontally pivoting design that allows full trunk access without having to move the arms out of the way. The arms have adjustments for width to provide maximum passenger comfort. They attach to a sturdy steel mounting plate that fits directly behind the speaker box. Fits touring models 2013 and earlier. 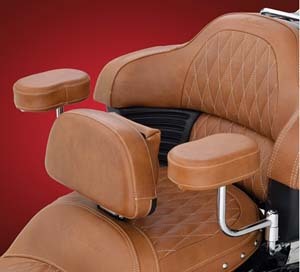 AM-24: This set of armrests is for that elite rider. All billet machined aircraft aluminum and triple chromed to the highest quality. With over 2 inches custom upholstered cushions and fully adjustable, these babies scream out comfort. 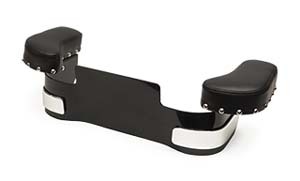 Don't forget that your passenger can also add that certain mug and/ or RAM mounts for that IPOD, GPS, etc as the AM-24 has machined 1/4"-20 threads underneath the armrests in both sides for the Ultimate comfort! 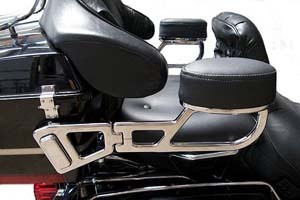 These American made billet armrests fit all Harley Davidson's with a Tour-Pak (TriGlides/ trikes included). AM-24B: Same as above but in black. AR-79: Comfort & flexibility unlike any other, the best just got better. These passenger armrests come on & off in minutes with no tools & feature pivot joints with variable tension adjusters for the ultimate fit. Compatible with our Quick Adjust Tour-Pak Relocator (RQ-73). 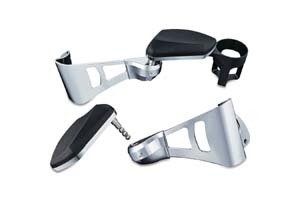 Fits: '98 - '13 Touring Models with rigid mounted or detachable King or Chopped Tour-Paks. Will not fit Trikes. 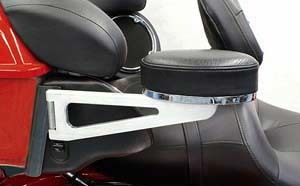 AR-81, AR-82: Travel in comfort and style with our Passenger Arm Rests designed specifically for H-D Dressers. Passengers can enjoy added comfort on those long rides. Swing-away design does not interfere with the passenger mounting or dismounting the bike. A built-in cup holder keeps a cold (or warm) drink at their fingertips and includes a foam can cooler. P/N’s AR-89 & AR-92 are compatible with Relocator Kit for Tour-Pak (P/N RK-1B). 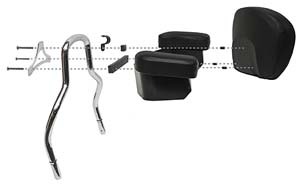 Designed to work with King or Chopped Tour-Paks on H-D Detachable Two-Up Tour-Pak Rack (P/N 53276-04) or Solo Tour-Pak Rack (P/N 53260-02). Versions are offered for use with or without our new Relocator Kit for Detachable Tour-Pak. 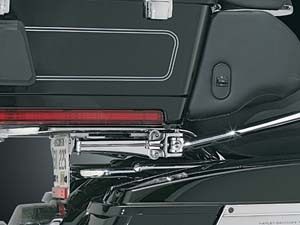 Note: P/N’s AR-81 & AR-82 are not compatible with H-D’s original Detachable Tour-Pak Rack design (H-D P/N 53107-96). This style of rack has a tubular frame topped with a flat plate. 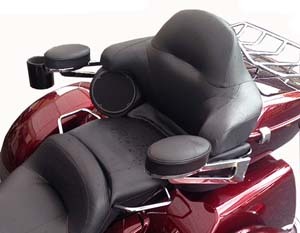 AR-202: Deluxe Passenger Armrests for Indian from are available in black. These armrests mount to the quick release trunk bracket creating a hidden mount and easily pivot out of the way for convenient passenger access. The tension of the pivot is adjustable! For the Roadmaster and optional trunk on Chieftain and Chief. 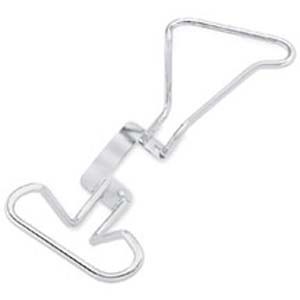 Includes stainless steel hardware and bright chrome finish for long term durability. Includes required hardware to mount along with completeinstructions. 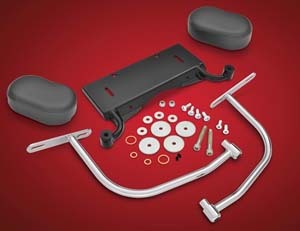 Fits: Indian Quick Release Trunk, 2014-Newer. AR-203: Similar to above but in Tan. 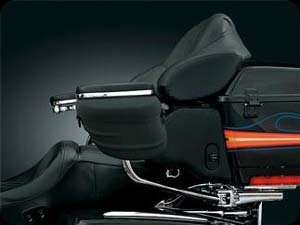 PALH-2: Armrest provides your passenger with even more comfort for Harley-Davidson, Indian, Yamaha, Honda, Kawasaki, and any other motorcycle that has a backrest. 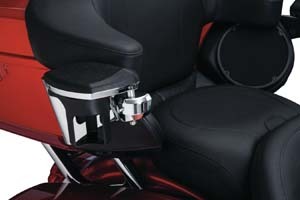 This is a newly redesigned rear seat armrest, which provides rear rider comfort. 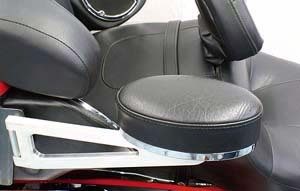 The new version of the arm rest features added side and rear chrome molding, a black gloss finish, and larger wrap around arm cushions. 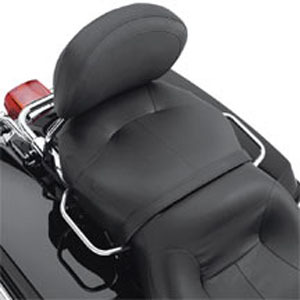 This rear armrest provides extra protection and comfort for the rear seat rider. 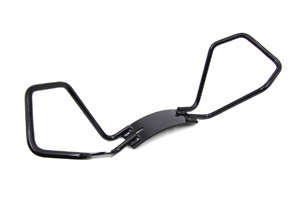 Frame is constructed with 1/8" black, gloss finished aluminum. Armrest is black vinyl hand sewn foam cushion. 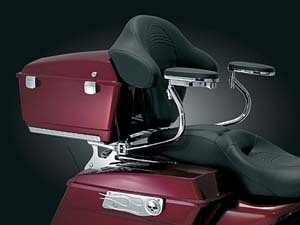 Easy installation utilizing the existing screws that hold your backrest in place. It will be necessary to drill two 1/4" holes in the back of the armrest to match the existing backrest mounting screws. Complete instructions will accompany the shipment. Easy to remove for solo riding. Fitmment: Fits backrests at least 8 to 9 inches high from the top of the seat. 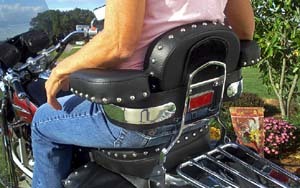 The Armrest slips between the backrest and the sissy bar. 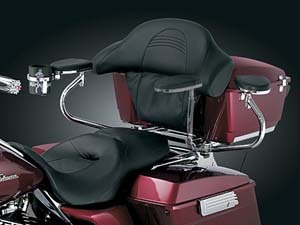 Extend approximately 5-inches in front of your backrest. 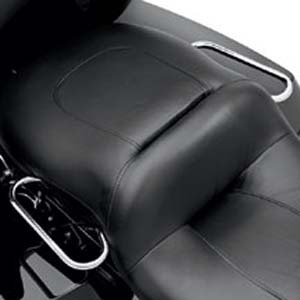 This depends on the thickness of your backrest. The pads are 3-inches wide by 8-inches long. The foam is 2-inches thick and covered by hand sewn black vinyl. 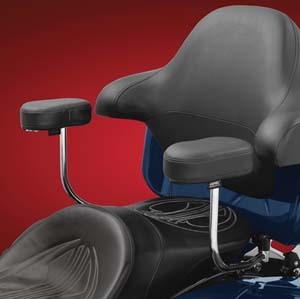 They are mounted stationary to the sissy bar and backrest, it extends out ~5 inches forward from the front of the back rest allowing sufficient space for easy mounting and dismounting. 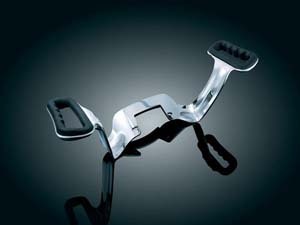 15" spacing between armrest pads: Fits 8 to 9-inch wide sissy bars. 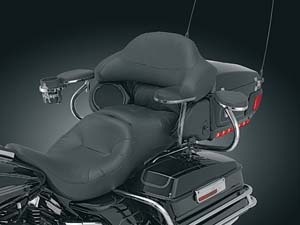 17" spacing between armrest pads: fits Sissy Bars up to 12 inches. 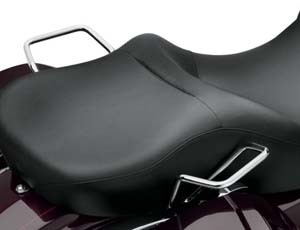 Curved Backrests: Passenger backrests with a curved. These backrests have an arched back (pictured below) that our Armrests are custom formed to fit. 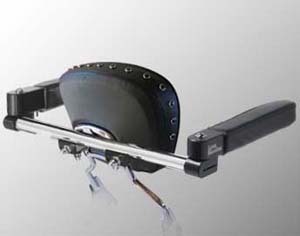 Adjustable inner width of 15-inches to 17-inches. 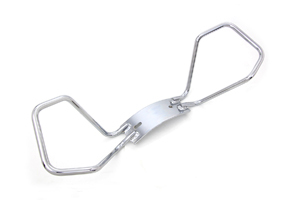 They can fit sissy bars up to 8 ½ inches in width. An accessory Cup Holder option is also available. 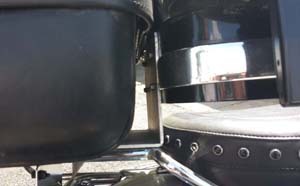 Note: If your sissy bar is recessed into the back of the backrest you will need the Spacer Kit to fill in the area, to make it even with the rear of the backrest. PALH-2S: Similar to above but with studs. 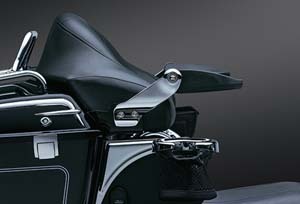 PALH-1: Now for the Road King, Road Glide and Street Glide. 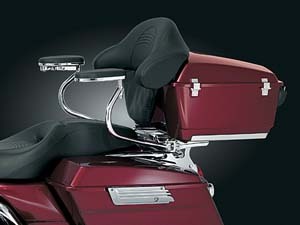 Custom passenger armrest for backrest means comfort, support and a feeling of security for the person behind you. 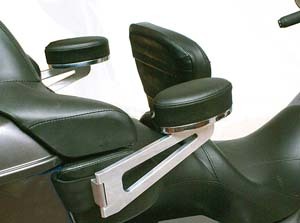 These Armrests give your passenger something solid and secure (but padded and comfortable) to rely on. And more comfort means longer, more pleasant rides for the driver, as the passenger will lean more naturally with the bike. No more cramped shoulders caused by tension in turns, no more grimaces going over rough roads, no more rides that end before they should! Special sale order! 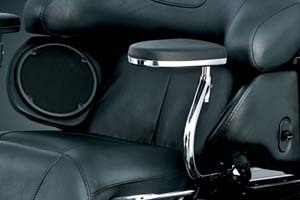 The PALH-1 uses chromed steel in the crossbar and fasteners, rich black anodized, aircraft-grade aluminum on the arm pivots and the same highly durable, hand-stitched, synthetic leather found in the best motorcycle seats. The sleek, streamlined design works with the beauty of your bike. The PALH-1 only take a few minutes to install. And just a few seconds with an allen wrench to tweak for the perfect armrest angle to match your rider's height and angle of comfort. Removable for Solo Riding. Lifetime OEM warranty. 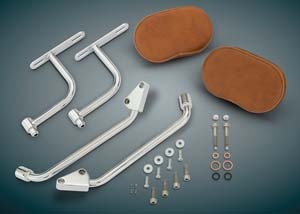 The unique stainless-steel ball spring catch and stainless-steel detent system gives the rider plenty of comfort whether you're on a straight-away or in the twisties. It won't pop loose under normal riding conditions, but with outward pressure the spring mechanism will snap open for easy exit. 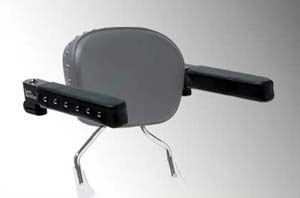 The passenger armrest pivot system also pivots 180 degrees backward, for use as a luggage rack. PALH-1S: Same as above but with studs. 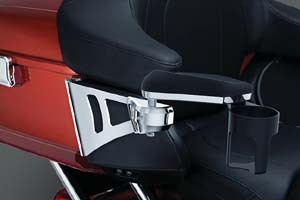 PALH-LB: L bracket that can be used to install the PALH style Armrests on older bikes and/or leather tour-paks. The customer will have to drill holes in the L bracket to match the holes that are in the bottom of the tour-pak and tour-pak mounting bracket. This is a custom part. 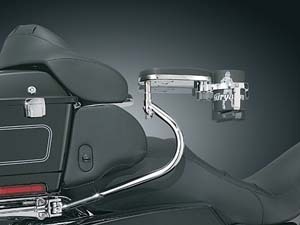 PHR-90: Pass Add comfort and confidence for your riding companion or a secure tie-down point for pillion-mounted touring luggage. Chrome-plated handrail. Convenient passenger hand grip. Secure tie-down point for pillion-mounted touring luggage. 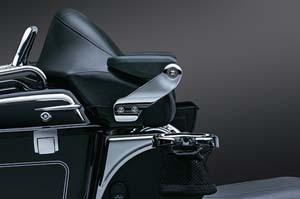 Fits '14-later Touring and Tri Glide™ models. Does not fit models equipped with Tallboy® Seats or Passenger Armrest or FLHTKSE and FLTRUSE models with Original Equipment seat. PHR-90B: Similar to above but in black. PHR-83: Add comfort and confidence for your riding companion. 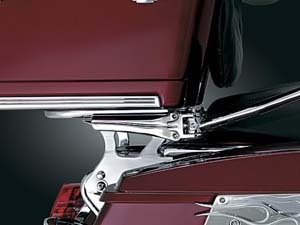 Chrome-plated Handrail provides a convenient hand grip for your passenger, and a secure tie-down point for pillion-mounted touring luggage. 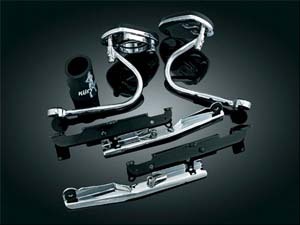 Fits '06-'08 Electra Glide, Street Glide, Road King and Road Glide models. 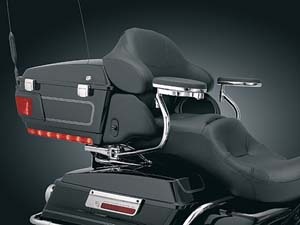 Does not fit Touring models with Tour-Pak mounted rear speakers, or models equipped with Leather Saddlebags. Original Equipment on '99-'05 FLHT, FLHTC and FLHTCU models. Special order item. 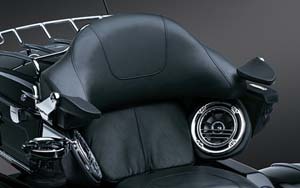 PHR-26: Add comfort and confidence for your riding companion. 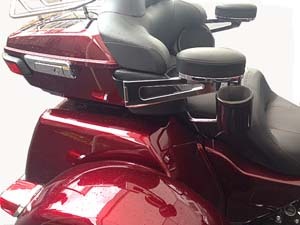 Chrome-plated Handrail provides a convenient hand grip for your passenger, and a secure tie-down point for pillion-mounted touring luggage. For a custom look, add Passenger Handrail Covers (sold separately). Fits '09 to current Touring models (except FLHTCUTG, Trikes). Fits with passenger Handrail Cover. Special order item. 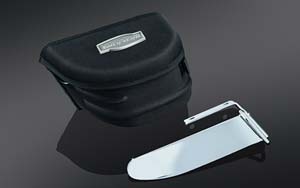 PHR-31: Also for your Softail/Heritage platform. Add comfort and confidence for your riding companion. 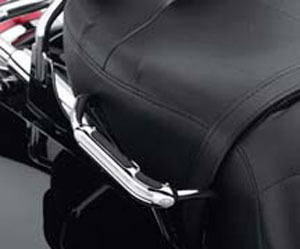 Chrome-plated handrail provides a convenient hand grip for your passenger, and a secure tie-down point for pillion-mounted touring luggage. 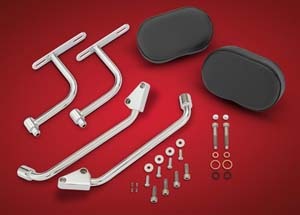 For a custom look, add Passenger Handrail Covers P/N 91668-05 (sold separately). Fits '06 FLSTF and '06-later FLST, FLSTC, and FLSTSC models. Special order item. Fits '06 FLSTF and '06-later FLST, FLSTC, and FLSTSC models. PHR-36: Similar to above but for: Fits '06-later FXST, FXSTB, FXSTC, FXSTS, and '07-'08 FXSTSSE/2 models. PHR-68: Passenger Hand Rail Covers. 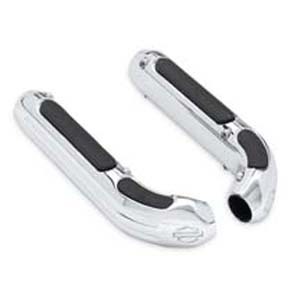 Beef up the look of the passenger handrail with these easy-to-install chrome-plated grips. The thick diameter offers a firm and comfortable hand hold for your passenger, and feature jet black inserts, "ball-milled" grooves and Bar & Shield logo for added style. 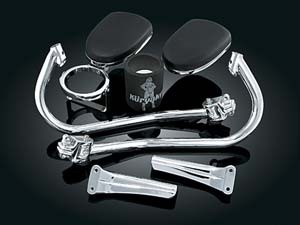 Kit includes right and left grip and stainless steel mounting hardware. Fits '99-later Touring models equipped with accessory Passenger Grab Rails. Special order item. 8954: Cup Holder for AR-53, sold separately. 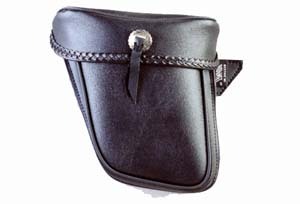 1695: These great pouches have room for your essential items such as a cell phone, sunglasses, or iPod. In addition to the fixed mounting options, our pouches also include a quick detach system allowing to be used as a fanny pack or purse. The Gen 2 features a redesigned mounting bracket and full coverage lid. All designed to enhance not only function but form also. 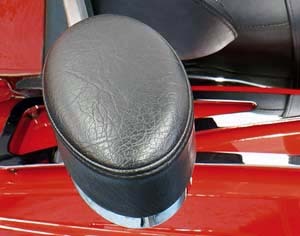 Left side of passenger armrests AR-79,81,82 for Touring Models Dim: 8-1/4" Wide x 4-1/2" High x 3-3/4" Deep Cubic Inches: 90. Fits: '98-'13 FLHTCU, '10-'13 FLHTK, '11-'13 FLTRU, '08-'13 FLHTCUSE, '11 FLTRUSE & '09-'13 FLHTCUTG. 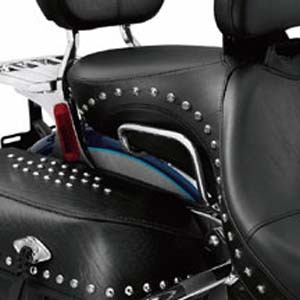 HD-106: These pouches bolt to the existing tour pack armrest/backrest. No modifications are needed. Adds handy and convenient storage for the passenger, removable pouch easily slips off.